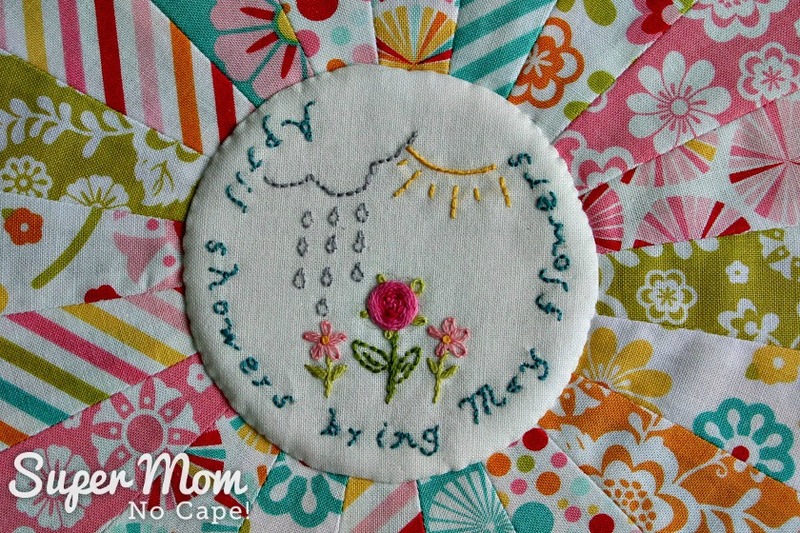 April Showers Embroidery Pattern - Super Mom - No Cape! On the first Monday of each month, I share a free embroidery pattern for you to stitch. 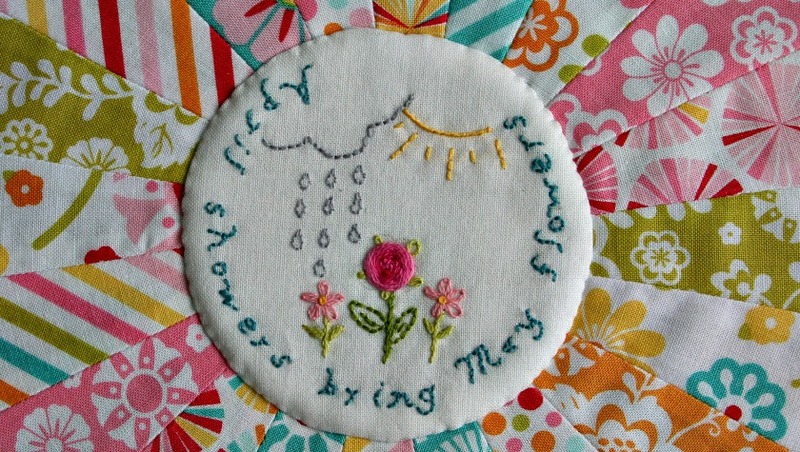 This month’s April Showers embroidery pattern was such fun to design and work on because the idea for it has been in the back of my mind for quite some time. For over a year now, I’ve had an unfinished Dresden plate just waiting to be completed. In fact, if you follow me on Instagram @supermomnocape you may remember seeing it. 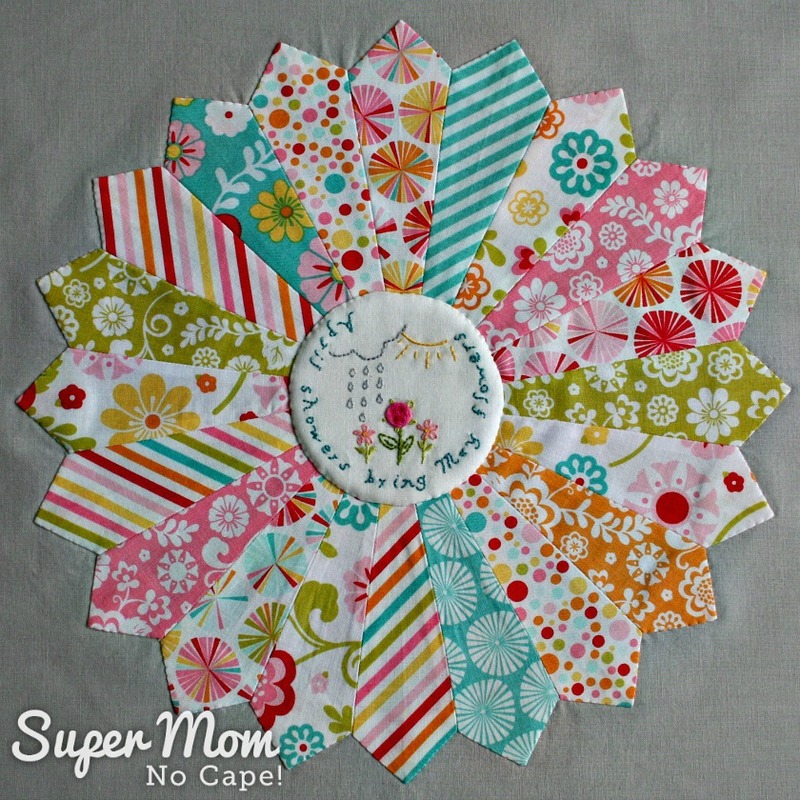 It was made from leftover charm squares of Fancy Free by Lori Whitlock for Riley Blake Designs. In my Instagram post I mentioned that I planned to embroider the center circle of the Dresden plate. 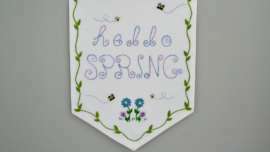 I had the basic idea of what I wanted but it wasn’t until a few days ago when looking at the pretty spring colors in the block that the idea began to gel and the April Shower embroidery pattern came to life. I’m super pleased with how it turned out! To duplicate what I’ve done use 2 strands of DMC embroidery floss except where indicated. 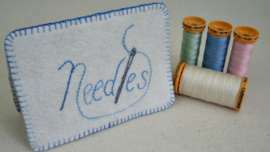 For the blue lettering, stitch in backstitch, using DMC 48. Backstitch the cloud and rain drops with grey DMC 318. Use one strand of floss for the raindrops. The sun is a whipped backstitch with backstitched rays in yellow DMC 743. Work the green stems of the small flowers in DMC 472 and the large flower in DMC 581. Embroider the small pink flowers using five lazy daisy stitches in DMC 776. The centers are french knots in the same yellow as the sun. While the pattern is designed to fit the center of a 12.5″ Dresden plate, it could just as easily be stitched to create a needlebook, a small coin purse or pincushion. One of the things I love about embroidery is that you can take a basic design and make it your own by using floss colors of your choice and then turning the finished piece into whatever item you like. Click the link below to download April’s free embroidery pattern. 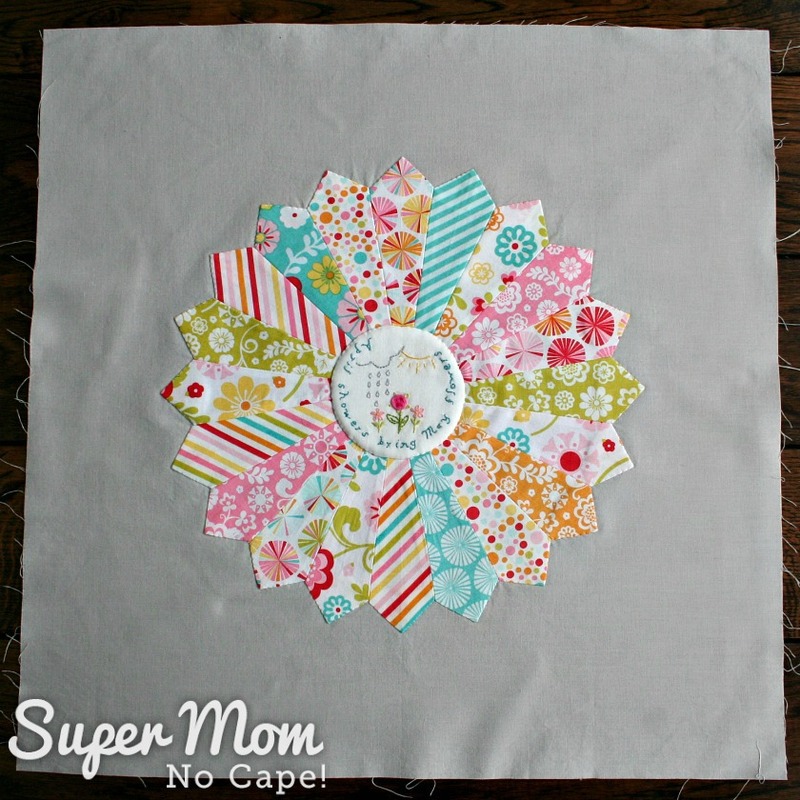 Yesterday, I hand stitched the Dresden plate and the April Showers center to a medium gray background. I had hoped to be able to make several more of these Dresden blocks with different embroidered centers for each but I haven’t been able to find any more Fancy Free charm packs so I’ll be turning the above orphan block into a pillow cover. Now it’s time to share what you’ve been working on! 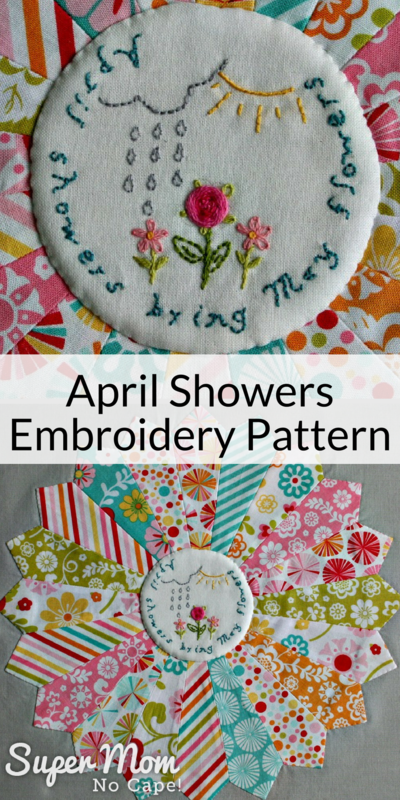 Be sure to save this April Showers Embroidery Pattern post by clicking on the Pinterest button underneath this post. That is so cute and I like how the embroidery colors are all in the plate pieces. Thank you Mary! I did try my best to match the floss colors to the different colors in the fabric. This is going to make a gorgeous pillow cover. 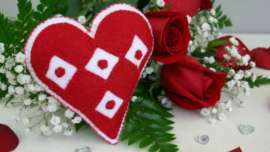 Quilting is really beautiful and although I do lots of different crafts, I have never quilted. This is gorgeous. Thank you so much Leanna for your lovely comment and compliment! Thanks for the pattern. I sent the link to a friend who is making Dresdens for her CQJP2018, in case she wanted to use it in the center of one. Thanks for hosting the link party. I love your dresden plate and your embroidery design is so pretty. 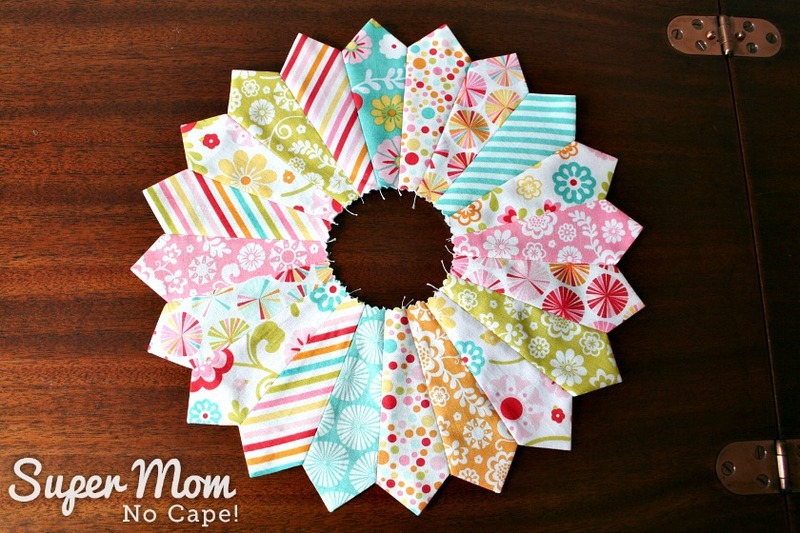 I joined this months link up and then realized that my post did not include any stitching this time as I didn’t have any updates. Sorry about that. Thank you for hosting this link party. I’ve always been envious of other people’s embroidering abilities. Pretty awesome stuff! Hi Sue, Sorry I haven’t visited for a while. I love your dresden and stitchery. It is going to be lovely as a pillow. Those embroidery patterns are pretty, nice and simple. Thanks for sharing with us. Thanks so much for stopping by Mary and for your sweet comment.